Wolfhound Jacket of Helikon-Tex®. 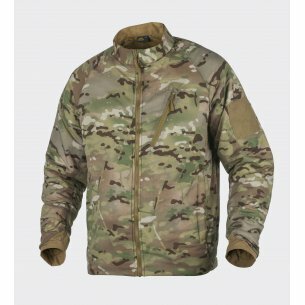 Jacket is a lightweight & insulated mid layer that can be used stand-alone or underneath outer layers. Hydrophobic properties of Climashield® Apex™ keep user warm and dry in cold weather conditions. If exposed to moisture, textile dries immediately. Nylon outer layer provides durability, secures insulation material and provides crucial wind and water resistance without blocking the breathability. Two bottom side slash pockets are lined with fleece and provide protection for hands against cold. Wolfhound is highly compressible - can be stuffed in a pack or cargo pouch, without any damage to its properties. 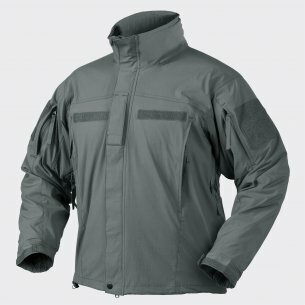 The Wolfhound jacket is a men's Helikon Tex® jacket. This is the highest quality outerwear for outdoor, survival and business use. The Helikon Wolfhound jacket was made using a material that provides full insulation: Climashield Apex (67 g / m2). Military men's jacket - successfully used by uniformed services. 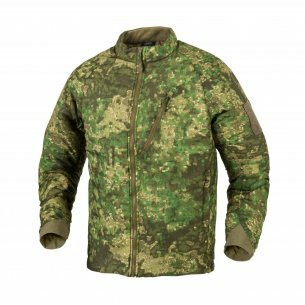 The Helikon Wolfhound camo jacket is equipped with additional functions to facilitate field work of the special services and the police. It can also be used as a military jacket. The velcro panel is located in the upper part of the left sleeve. This panel allows identification and can be freely personalized. The jacket is equipped with an inside pocket, closed with a zipper. This pocket can be successfully used to store important documents. In addition, the jacket has three pockets closed tightly on the YKK® zip: one on the chest and two on the bottom. Chest pocket, is equipped with special compartments and glands for carrying electronics together with cabling. The jacket is very light, it can be used as a top coat, as well as in the form of additional insulation. The Helikon Wolfhound military jacket can be quickly folded using the included compression bag. It is lightweight, capacious and handy during transport. The colors of the jacket, maintained in Coyote camouflage colors. The insulating material used in the jacket is the qualitative Clasashield Apex Insulation (67 g / m2), which ensures full thermal insulation even in case of dampness. The material dries at a rapid pace. From the outside, the Helikon Wolfhound Climashield Apex jacket is protected with Nylon ripstop material, which at the same time provides excellent air permeability. Standing collar, padded with fleece, also ensuring full insulation, even if it gets wet. The collar is additionally equipped with a puller. The VersaStrech® material was used under the armpits and at the ends of the cuffs. It improves ventilation and evaporation, while the thin and flexible structure ensures high comfort of movement. Used at the cuffs, thanks to the properties of perfect fit to the shape of the body, it protects against wind and heat loss. The YKK® lock, enriched with an additional thermal layer, ensures tightness. 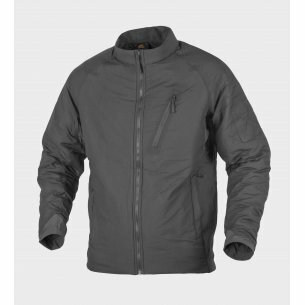 Men's Helikon Tex Wolfhound jacket can be used as outdoor clothing, protecting against difficult weather conditions. Survival, sport and travel are also an ideal destination. Used as part of the "onions" kit, it helps to modify the outfit in the event of changing thermal conditions. Universal design, allows for versatile use. 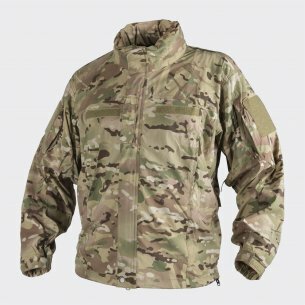 The jacket can be used by military services, providing them with anonymity or recognition - depending on the requirements of the situation. The Helikon Tex brand is a renowned company operating in the military textile industry for over a decade. However, since 1999, the brand has been involved in the production and, in part, in the design of tactical, survival and outdoor clothing. The clothing of this brand is always made using the highest quality materials. It is adapted to the needs of both uniformed services (police, special services and army) as well as for all enthusiasts of outdoor activity, in the broad sense of the word. 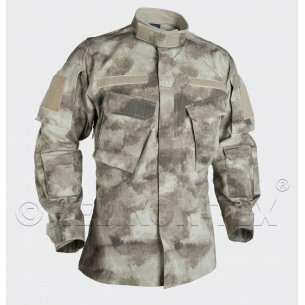 Tactical clothing has considerable advantages, which ensure high comfort of use. Hence, the popularity of such clothing has grown remarkably. The company Helikon Tex® in its offer has clothing for universal use. This clothing can be modified depending on our needs. This is not only outerwear, but all kinds of wardrobe equipment. 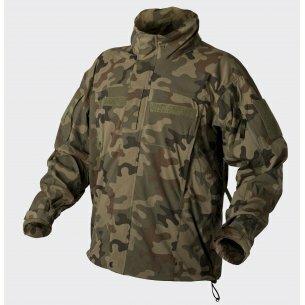 In addition, the offer includes tactical clothing clearly divided, depending on the function. For example: Urban, Medical, Morale, Outback or Patrol.